Andy Boyd thinks he is the luckiest man alive. Widowed with a young child, after his wife dies in childbirth, he is certain that he will never again experience true love. Then he meets Anna. Feisty, fun and beautiful, she's his perfect match... And she loves his son, too. When Andy ends up in the hospital on his wedding night, he receives his first clue that Anna is not all that she seems. He ignores it; a dangerous mistake that could cost him everything. A Suitable Lie was a book I didn’t dare to put down. It was an absorbing, powerful and scarily believable story of raw emotion and abuse, one that was both thrilling and distressing in equal measures. 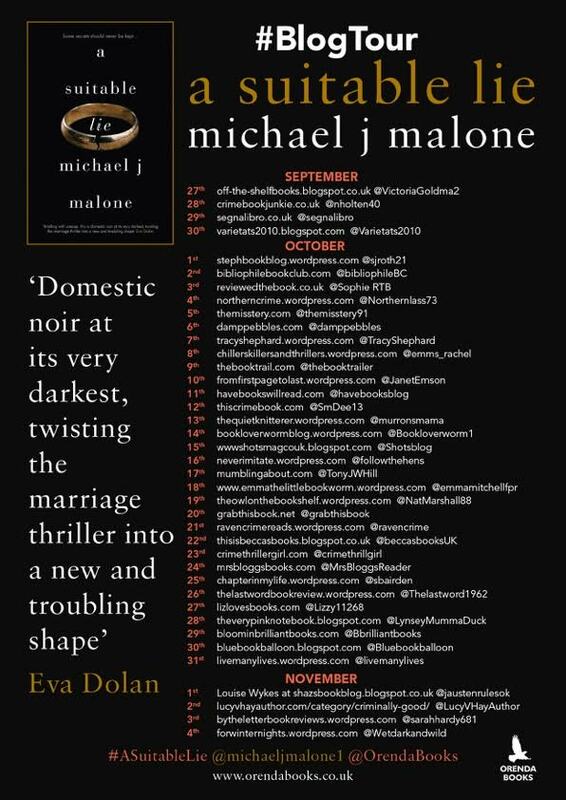 I loved the author’s style of writing – it was emotionally involving and thought-provoking, like the story was made for only Michael J Malone to tell us and it was the great writing that had me hooked on the novel, as in most other circumstances I’m sure the uncomfortable theme would have stopped me from devouring the book in two sittings. The theme of this book is a rare one in fiction, but it was perfectly consuming and delivered with huge plausibility. So gripping A Suitable Lie was from page one that for the first 80% I didn’t stop for breath. And the only reason I stopped then was to take in everything I’d just read, because this book is not one you will forget as soon as it’s over. It’s a story that will stay with me for a long, long time I’m sure, as the author’s writing drew me in and had me feeling every emotion and wincing and flinching at the incredibly impactful portrayal of abuse. Though there are plenty of twists and turns in this novel, they still came across as a natural and believable part of the story. I didn’t spend my whole time waiting for the twists because I was so engrossed in the entire story. It was the realism in this book that had me jumpy and in an almost dreaded anticipation of what was to come because Anna’s changeable personality not only had Andy walking on eggshells, it had me on the edge of my seat expecting her next blow to strike but not knowing quite when or how it was going to happen. The suspense in this book was at an ultimate high from the insanely gripping opening chapter to the final few pages. Andy and Anna are not the only pivotal characters in this book but they are two of the most exceptionally written characters I have ever read about. Anna, I hated her but I also loved to hate her. One of the scariest parts of her characters was how quickly she could transform from a loving wife to a violent one. And she made me fear for the lives of the people in her little family, wishing I could protect Andy and the little boys from her actions. Yet at the same time, the brutality of Anna’s character had me wondering what she could drive Andy to do. With the role reversal of the typical story of abuse, I felt for Andy and found that the author delivered his story brilliantly – with an honesty that is at times, understandably, emotionally overwhelming. However, this is a story that definitely needs to be told. 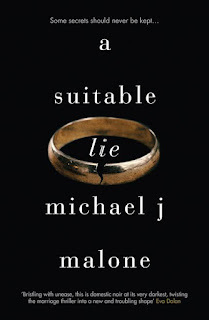 A Suitable Lie is one of the best books I have read - ever. I loved the author’s brave storytelling, and the credible and unsettling story of an abusive relationship is deftly combined with the wow factor that had me completely wrapped up in a twisted, addictive story of how one action can cause a life to spiral out of control, with severe consequences.